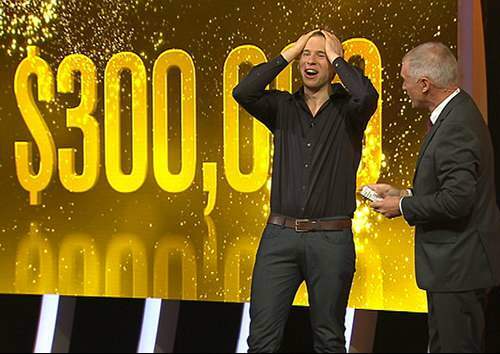 Alex wins the $300,000 on ‘Million Dollar Minute’! SH: In those first rounds, as you say, there are some questions that are really anticipatory. There was one question in Million Dollar Minute in one of your games, and it was about the song – one of your opponents got it wrong – but it was about the song On The Road To Gundagai. (“There’s a track winding back to an old fashioned shack along the road to Gundagai”). I think it was “…leading to which country town?” but I think the woman buzzed in and said “an old fashioned shack”, which came before that in the lyric. A lot of those ones, you do need to be a bit intuitive about how questions are written. I thought if I were answering that, I’d just fill in the whole of that lyric, because the answer would be in there somewhere. In those real anticipatory ones, there could be one or two answers but you have to wait till the very end. “Which citrus fruit…” And she buzzed in “orange!” But you needed the second half of the question; “has a variety called Ruby Red?” and the answer was “Grapefruit”. You need to listen for a bit more time to get them. SH: Watching your episodes – and you very kindly gave them to me in VOB format – I played them on the VLC Media Player on my computer. And because I was at a bit “time poor”, I did it at twice the normal speed. You could still make out the words and I could understand it all. And I thought “if I were going on this show soon, I’d record the shows and somehow burn them to disc and I play them on my computer, using VLC Media Player, at twice normal speed”. I was playing along and still buzzing in and making an OK show of it. I just wonder if there’s anything in that as a training technique, it just occurred to me and when you get into the studio to play the game, it would feel like it’s going only half as fast, and so you’d blitz it, wouldn’t you? What do you think? AD: Definitely. I hadn’t even thought of that. Definitely playing at that high speed, just like lifting heavier weights would make you a stronger player. SH: So when you come to do the real thing, it would all seem to be moving in slow motion which I believe is exactly what it is like for a Jedi Knight. That’s my understanding of the Force. I think when they’re deflecting energy bolts with their lightsabres, I am pretty sure they all see it coming in slow motion, so it is pretty similar to that. SH: You stated on the show that your goal was to get to the $75,000 safe money level. For people who don’t know the show, this is when you’ve been through a number of nights. Is it three nights? AD: Three nights, assuming that you don’t make any mistakes in the 5 questions. SH: That’s right, and then after that you can leave and you get at least $75 000. When you got there you were happy to play the next night, to get the $100 000 level. I am guessing that was on a logic that if you lost that game you would not lose anything and you would still be going home with $75 000. Was that your thinking? AD: Definitely was. When you are standing to gain $25 000 and the possibility to go on, for no loss, and you are interested in continuing on for the glory of the show, it was a no-brainer. SH: Then, after you won that $100 000 night, you had the option to come back and play for $200 000, which you did. On that night when you had already won the $100 000 playing for the $200 000 were you then thinking “if I play for the $200 000 and lose, I’ll still leave with $75 000 which is not that much less than the $100 000 that I currently have”? SH: Then it gets riskier after that. Of course you won the $200 000 and decided to play for the $300 000 on the next night. Announcing this decision on the show you quoted your dad – or was it Homer? – when you said “To those that flee comes neither power nor glory.” You played the next night, you won the $300 000 and decided to leave with that $300 000 plus the safe money you’d accumulated along the way of another $7000. You did have the option of coming back the night after that to play for $500 000, leaping from $300 000 to $500 000 in one night! Why didn’t you come back the next night to play for the $500 000? And sorry to be such a tease, but that’s where we’ll leave it for this week. (I have to keep these posts to a manageable size, you know!) Check in next week, for the next part of this exclusive interview, in which Alex takes us through the remainder of his tactics for this part of the game, and we chat about mindgames and expectations among opponents…. This entry was posted in Game Show Winners, Interviews, Strategy, Tactics, Updates by Stephen. Bookmark the permalink.